HEVC (High Efficiency Video Coding), the new video coding standard, is the successor standard to H.264 which brings promise of huge bandwidth savings of approx. 40-45% over H.264 encoded content (ref. HEVC MP and H.264 HP with similar fps) with similar quality. However, until now, H.264 is the most widely accepted and adopted format in online and broadcast domain for content compression and distribution, new hardware devices will need time to support the new H.265/HEVC codec, which means it is required to convert HEVC/H.265 MP4 to AVC/H.264 MP4 with the best H.265 decoder for codec incompatibility issues. To realize the H.265 playback on media players, mobile devices and TV or share with your friends on the Internet, you will have to unlock a series of video codec puzzles – HEVC/H.265. This tutorial explores the solutions to decode a H.265 video and convert HEVC/H.265 MP4 to AVC/H.264 MP4 on Mac Yosemite for various uses. Good News! Pavtube iMedia Converter for Mac (Here is review) is now upgraded to version 4.8.5.1with the addition of H.265 encoder and H.265 decoder. 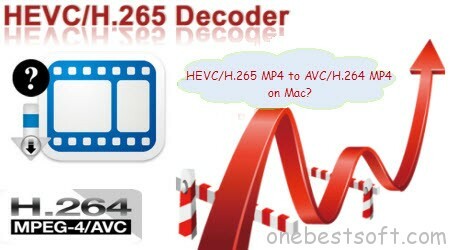 This updated Mac H.265 decoder can give you a hand to manage HEVC/H.265 MP4 to AVC/H.264 MP4 covnersion on Mac Yosemite. No matter you are looking for encoding video to HEVC/H.265 or decode HEVC/H.265 video to other video formats, the professional Yosemite HEVC/H.265 Converter will fulfill your task fast and easily. As a professional HEVC decoder, it can decode and convert HEVC H.265 video in various resolution like 4K UHD 4320p, 8k to all most video formats MP4, MOV, AVI, etc., and can extract audio, music from HEVC and save as MP3, M4A, OGG, FLAC, WMA, etc. As an excellent HEVC encoder, it can encode and convert HEVC H.265 from Blu-ray, DVD and various video formats including MP4, MOV, AVI, H.264, etc. It owns powerful converting functions and flexible editing functions. All in all, iMedia Converter for Mac is complete video toolbox to convert, edit, enhance, organize, capture, and preview any video including the latest HEVC H.264 video on Mac for multiple use with no limitation. Supported Mac OS X System: Mac OS Sierra, Mac OS X 10.11 El Capitan, Mac OS X 10.10 Yosemite, 10.9 Mavericks, 10.8 Mountain Lion, 10.7 Lion, 10.6 Snow Leopard, 10.5 Leopard. Step 1: Import HEVC/H.265 MP4 video. Run the Pavtube iMedia Converter for Mac, click “Add video” button to load mp4 videos to the program, or also support to drag and drop mp4 files to the program. 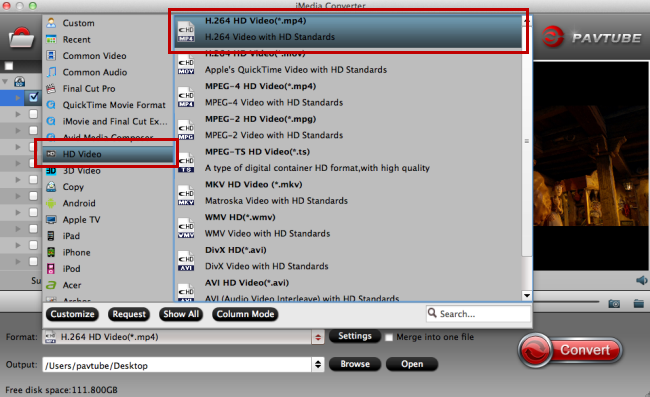 Step 2: Choose AVC/H.264 MP4 format. Go to choose the proper format what you need. Click “Format” to choose “HD Video > H.264 HD Video(*.mp4)” or “Common Video > H.264 Video(*mp4)” as you like. Find “Edit” icon and then click it, you will find video editor. There you can trim, crop, add watermark and effect. And subtitle can be also added to your MP4 video. Click “Settings” to customize the video and audio settings. For video settings, you can adjust Encoder, Frame Rate, Resolution, Aspect Ratio and Video Bitrate. For audio settings, you can adjust Encoder, Sample Rate, Channels and Audio Bitrate to meet your needs. Step 5. Start HEVC/H.265 MP4 Conversion on macOS High Sierra. Click “Convert” button to start conversion. The conversion from HEVC/H.265 MP4 to AVC/H.264 MP4 on Mac Yosemite which will be done in amazing fast speed, which costs you a few minutes thanks to its advanced feature and easy-to-use interface. After conversion, go to find the converted files by clicking “Open” button. In this way, you will change video format from HEVC/H.265 MP4 to AVC/H.264 MP4 on Mac Yosemite with ease and successfully playback media players, mobile devices and TV or share with your friends on the Internet.